A firm belief that the ends justifies the means. A complex nature, complete with a good side, i.e. he may blow up the museum to stop the looting of his culture, but he takes his mother to church each Sunday. In my latest release, ENTHRALLED, my villain gave my critique partner chills. I also shocked myself in that I took a historical figure that I've studied and in some ways admired, and then turned her into a dispassionate villain that will stop at nothing to achieve her goals. In the book, Queen Eleanor of Aquitaine's attempt to murder her husband, King Henry II, and rule as regent through her eldest son. Although the historical record is more detailed for Eleanor than for many medieval women, we know little of her personality, her desires or her opinions. She wed Henry of Anjou (later King Henry II of England) in 1152, months after her marriage with the French king was annulled. Henry was 10 or 11 years her junior. 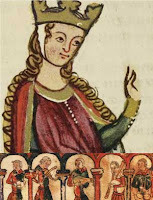 She gave birth to at least eight children during the marriage, and the youngest, John, was born in either 1166 or 1167 when she was approximately 45 years old. However the marriage began, it ended badly. She encouraged estrangement between father and sons, and led her sons in rebellion against Henry in 1173. She spent 15 years locked in a tower, released by her sons on the king's death. Given those facts, the Eleanor in ENTHRALLED is cold and calculating, yet understandable (I hope). The story takes place seven years before she sparks rebellion among her sons, but at 44, her legendary beauty is fading, her husband is openly in love with another woman, and her children are no longer under her direct control. Her motivation is simple: She’s standing at the edge of irrelevancy—and she doesn’t like the view. Eleanor makes a fabulous villain. Going to have to read your book!